Private collection, New York; Estate sale, Christie's, New York, 15 November 1988, lot 51. Private collection, Switzerland (acquired at the above sale). Acquired by the present owner, circa 1990. W. Boeck and J. Sabartés, Picasso, New York, 1955, p. 243 (illustrated prior to signature, p. 409; titled Nush Eluard). C. Zervos, Pablo Picasso, Paris, 1958, vol. 9, no. 207 (illustrated prior to signature, pl. 100). The Picasso Project, ed., Picasso's Paintings, Watercolors, Drawings and Sculpture: Spanish Civil War, 1937-1939, San Francisco, 1997, p. 184, no. 38-153 (illustrated prior to signature). I. Mössinger, Picasso et les femmes, exh. cat., Kunstsammlungen Chemnitz, 2002, p. 201, note 20. J. Palau i Fabre, Picasso: From the Minotaur to Guernica, 1927-1939, Barcelona, 2011, pp. 394 and 449, no. 1219 (illustrated prior to signature, p. 394). Picasso painted Buste de femme at the Hôtel Vaste Horizon in Mougins on 28 August 1938, during the third successive summer he vacationed in this small, aptly named pension overlooking Antibes and the Mediterranean, in the very village where, a quarter-century later, in 1963, he decided to make his final home. The surrealist Paul Eluard, acknowledged in his lifetime as one of the greatest French lyric poets of the 20th century, was during the mid-1930s quickly becoming Picasso's closest and most cherished male friend. He and his wife Nusch had recently discovered the Vaste Horizon and urged the artist to join them there in 1936. That summer would prove most memorable indeed: it was then Picasso connected with Dora Maar, with whom--through Eluard--he had earlier become acquainted in Paris. Dora had also received an invitation from the Eluards, who had been hoping to bring her and Picasso together, but she had been making plans of her own to meet Picasso in Mougins in early August. Dora and Picasso stayed on through September, after their friends had departed, "for what soon turned into a veritable honeymoon," as Anne Baldassari described their time together (Picasso: Life with Dora Maar, exh. cat., Réunion des Musées Nationaux, Paris, 2006, p. 193). They returned to Paris that autumn as lovers. The woman in this painting is not Dora, however, but instead someone no less fascinating and perhaps more strikingly beautiful--another of those extraordinary women who, like an artist's dream of the muses of antiquity, moved among and haunted Picasso's inner circle during the 1930s. She is Nusch Eluard. The tell-tale signs are her wide almond-shaped eyes and the mass of ringlets in her gloriously wavy hair, held back from her full-moon face with a crowning ribbon and bow, perhaps following a swim at the nearby Plage de la Garoupe. The deteriorating political situation in Europe notwithstanding, these summer holidays were among the best of times Picasso and his friends would enjoy for the remainder of the decade and much of the next to come--this third stay would prove to be their last there before Europe plunged in the throes of the Second World War precisely a year later. Roland Penrose was present during the summers of 1936 and 1937; first with his wife Valentine, and the following year with his new girlfriend Lee Miller, whom he later married. Penrose's Picasso biography is especially engaging in its first-hand reminiscences of these halcyon summer holidays (Picasso: His Life and Work, Berkeley, third ed., 1981, pp. 290-293, 310-315 and 317-319). Man Ray was also there--Lee had earlier worked as his assistant and they had been lovers--together with his new girlfriend Adrienne ("Ady") Fidelin. "We all stayed at a pension hotel the Vaste Horizon...lunching and dining on the grapevine-sheltered pergola," Man Ray described the group's daily routine during the summer of 1937, certainly the high point of these shared vacations, following the all-out effort Picasso spent in painting Guernica. "After a morning on the beach and a leisurely lunch, we retired to our respective rooms for a siesta, and perhaps love-making. But we worked too. In the evening Eluard read us his latest poem, Picasso showed us his starry eyed portrait of Dora" (Man Ray: Self-Portrait, Boston, 1963, p. 179). Nusch's life contained all the elements--part fairy tale, part survival drama, so desperately real but strangely other-worldly--that should entitle her to become a central character, occasionally perhaps upstaging Picasso himself, in the Vaste Horizon mise en scène. "Nusch" was the childhood nickname given Maria Benz, born 1906 in the Alsatian town of Mulhouse, then under German jurisdiction. Her father had been a circus acrobat and street entertainer. After an unsuccessful attempt at starting a career on the Berlin stage during the late 1920s, Nusch lived hand-to-mouth working in seedy music halls and performing pantomimes during intermissions at movie houses. She worked as an audience "shill" in a magician's and a hypnotist's stage acts, then joined a traveling circus. Arriving in Paris, she took parts in the gruesomely staged horror entertainments at the Grand Guignol. Just as Picasso had stumbled upon the teenaged Marie-Thérèse Walter outside the Galeries Lafayette department store on the Boulevard Haussmann in 1927, and to ease the despair of his marriage-weary middle age made her his redeeming amour fou, so Eluard and fellow poet René Char were out cruising for chance surrealist romantic attachments in the same vicinity on 21 May 1930. Eluard was desperately trying to get over the heartbreak of his broken first marriage, having recently separated from Russian-born Elena Diakonova, known as Gala, who had run off with Salvador Dalí. He and Char crossed paths that spring day with a strange, desperate, but beautiful young woman. Françoise Gilot, taking her information from Picasso, first told the story: "[Eluard] was captivated by the sight of this fragile girl going through her circus contortions right on the sidewalk" (Life with Picasso, New York, 1964, p. 136). Nusch gratefully accompanied the two poets to a café, where she wolfed down an entire basket of croissants. The girl was then twenty-three, completely down on her luck and nearly starving. "Nusch was, essentially, a personage of the Blue Period," Gilot wrote. "There was a sort of nostalgic element in that encounter that had touched Pablo, too, and recalled his Saltimbanques period of the early 1900s. That sort of evocation combined with her physical frailness made Nusch a very sensitive, poetic figure" (ibid.). Eluard, drawn to the girl's ethereal, waif-like beauty, and her tale of woe, took her back to his apartment and sheltered her for the night. Nusch never left him--they were married in 1934, even while Eluard was still pining for and maintaining contact with Gala. "For a while, Eluard loved both women," Sabine Rewald has written. "But in time, Nusch's devotion to, and passion for Eluard, as well as her intelligence and perseverance, allowed her to replace her predecessor in Eluard's heart (exh. cat., op. cit., 2002, p. 195). All of Picasso's friends at the Vaste Horizon during the summer of 1937 had been recently moving between romantic partners and were especially fluid in their sexual relationships. When Man Ray referred to their afternoon love-making, it may not have necessarily or always been between that same man and woman who had recently arrived in Mougins as a couple. Did Picasso sleep with Nusch? There are two stories, each told by one of Picasso's subsequent lovers. Both of them had it straight from the artist himself; but leave it to Picasso to have given out two versions of what transpired. "Pablo had had a vague affair with Nusch at that period, he told me," wrote Françoise Gilot, "and Paul--he was certain--had turned a blind eye to it: the ultimate test of friendship." Such an arrangement would have been nothing new to Eluard--he had consented to a ménage à trois between Gala, Max Ernst and himself that began in Germany during 1921, continued in Paris and ended half-way around the world in Saigon three years later (see R. McNab, Ghost Ships: A Surrealist Love Triangle, New Haven, 2004). "'But it was a gesture on my part, too,' Pablo said. 'I only did it to make him happy. I didn't want him to think I didn't like his wife'" (op. cit., 1964, p. 137). Picasso told a somewhat different story, however, to Geneviève Laporte, the young woman with whom he was having an affair while living with Françoise. "Nusch was admirable, just what Paul needed," Picasso told Laporte, who quoted him in her memoir of their relationship. "Paul, you know, wanted me to sleep with her...but I didn't want to. I liked Nusch very much, but not in that way. And Paul was furious. He said my refusal proved that I was really not his friend. Sometimes, Paul would disappear into a hotel with a whore, while Nusch and I chatted in some café nearby" (quoted in Sunshine at Midnight, New York, 1975, pp. 10-11). As William Rubin has noted, "Several of Picasso's biographers--some of them no doubt simply following Françoise Gilot--suggest that he and Nusch had had a 'carnal adventure,' most likely in 1937" (Picasso and Portraiture, exh. cat., The Museum of Modern Art, New York, 1996, p. 80). Pierre Cabanne dated their liaison to the summer of 1936, before the arrival of Dora: "Paul and Nusch Eluard were his closest companions for the summer, and since Paul in love could truly possess only what he shared, and love what he offered another, he gently eased Nusch into Pablo's arms. Nusch was very nice about it, and loved Eluard the better... His gift to Picasso of the woman he so passionately loved could only sublimate their friendship, for there was nothing underhanded or calculated in Eluard's behavior" (Pablo Picasso: His Life and Times, New York, 1977, pp. 289 and 291). Jean-Paul Crespelle claimed, "This brief affair plunged Picasso into one of his creative ecstasies: the portraits of Nusch he painted afterwards are among his most moving works" (Picasso and His Women, New York, 1969, p. 152). Interested readers will surely await John Richardson's sorting out of fact and fiction in the matter of Picasso and Nusch, as it may appear in the forthcoming final volume of his Picasso biography. Picasso painted fewer than ten known portraits of Nusch, five of which are illustrated here as the present picture and four related works. Six are in Zervos: vol. 8, nos. 369 and 377 [fig. 1]; vol. 9, nos. 202 [fig. 3], 207-208; and vol. 11, no. 274 [fig. 4]--plus two which are not (Picasso Project, nos. 37-198b [fig. 2] and 38-027). Judging from the signal blue facial tint, Femme assise (Zervos, vol. 9, no. 210), painted on the same day as the present picture, might be Nusch as well, although atypically with straighter, yet still wavy hair. 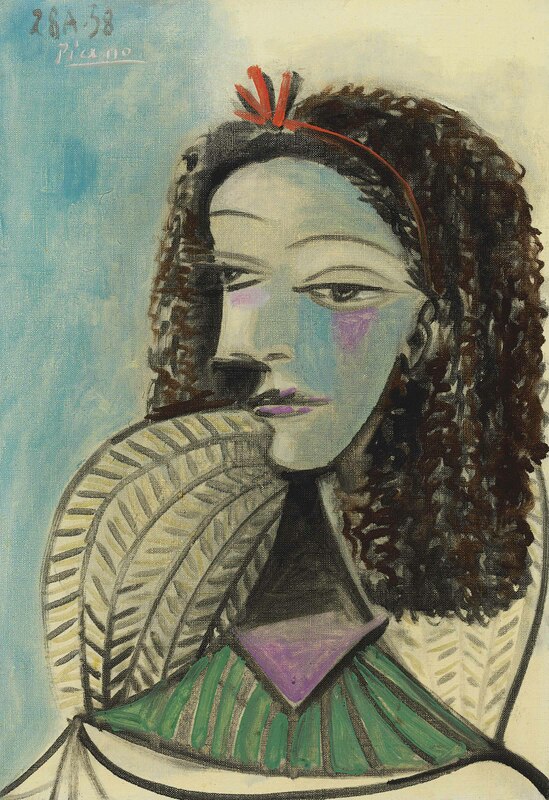 Picasso made a gift to Eluard of his last and most tender blue portrait of Nusch (1941; fig. 4). There are also a handful of drawings, including Picasso Project nos. 37-174 and 37-174(b), and Picasso and Portraiture (exh. cat., 1996), pp. 86 and 108. Both Eluard and Nusch served as clandestins in the Resistance during the wartime Nazi Occupation of France, frequently changing addresses to evade the Gestapo and police. Nusch's health was always fragile, as was her husband's, and the privations of the war and the shortages that persisted afterwards sapped her strength. On 28 November 1946, some six months after the end of the war, Nusch collapsed in the street from a cerebral hemorrhage while delivering food to her ailing mother-in-law, and died several hours later. "This death, so sudden and unexpected, plunged Eluard into a deep sadness," Brassaï recalled. "In losing Nusch, he also lost his faith in life, his hope in the world, in poetry itself. His friends--including Picasso and Dora Maar--who did everything to alleviate his pain, were powerless witnesses to his despair" (Conversations with Picasso, Chicago, 1999, p. 376, fn51). J.-C. Gateau, Eluard's biographer, declared: "Orpheus had lost his Euridice" (Paul Eluard ou le frère voyant, Paris, 1988, p. 309).